In the Missile Assembly Building at the US Navy's Pacific Missile Range Facility, a saucer-shaped test vehicle hangs during a measurement. The vehicle is part of the Low-Density Supersonic Decelerator project, is designed to land large payloads on Mars. The facility is located in Kaua‘i, Hawaii. NASA will try again this weekend to launch the first test flight of new technology designed to help land heavy payloads on Mars. The space agency aims to loft its Low-Density Supersonic Decelerator (LDSD) test vehicle Saturday (June 28) from the U.S. Navy's Pacific Missile Range Facility on the Hawaiian island of Kauai. The launch window opens at 2:15 p.m. EDT (1815 GMT; 8:15 a.m. local Hawaiian time); you can watch all the action here on Space.com, courtesy of NASA TV. Backup launch opportunities are available on June 29, June 30, July 1 and July 3, NASA officials said. And the mission may well need one of those alternate dates; the agency had originally planned to launch the LDSD test flight in early June, but strong winds repeatedly thwarted the attempt. 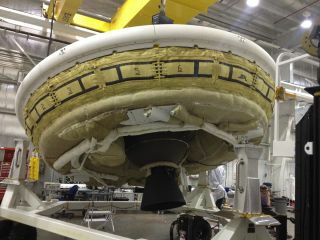 The LDSD test vehicle is equipped with a 100-foot-wide (30.5 meters) parachute and a saucer-shaped device called a Supersonic Inflatable Aerodynamic Decelerator (SIAD). This gear is being developed to help slow the descent of big, heavy payloads — such as human habitat modules — through the thin Martian atmosphere. During Saturday's test, a huge balloon will carry the 7,000-lbs. (3,175 kilograms) test vehicle up to an altitude of 23 miles (37 kilometers), then drop it. The vehicle's onboard rocket engine will roar to life at this point, blasting the craft up to an altitude of 34 miles (55 km) and a speed of Mach 4 (four times the speed of sound). The SIAD, which is designed to fit around the rim of an atmospheric entry vehicle, will inflate, slowing the vehicle down to Mach 2.5 by increasing its surface area (and thus its drag). Then the parachute will deploy, slowing the craft enough that it can make a soft splashdown in the Pacific Ocean. That's how the LDSD team drew up the test flight, anyway. But researchers say they'll learn a lot from the demonstration, no matter what happens.